Finnish advertising agency N2 wanted an event and customer space to their premices. N2 employs many of Finland top DJs and for them the quality of sound is essential. Danley Europe installed small but powerful set of 2 x Danley SH mini & 1 x Danley TH mini and the quality of sound was praised. We were looking for excellent sound system with a smashing installation service. After comparing may other systems we chose Danley. The quality-price ratio is awesome. 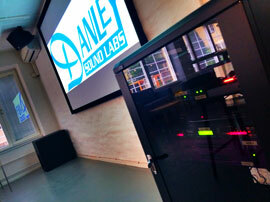 Thank you Danley Sound Labs Europe.